t, it's the little things that bother you. Catalac 8M's don't have a cockpit instrument design which would accommodate marine electronics. Even if it did, who would want to leave their marine electronics exposed to the Florida sun? The Nav station on the boat is too small to be useful, and it's in the port hull which isn't exactly convenient to the cockpit. 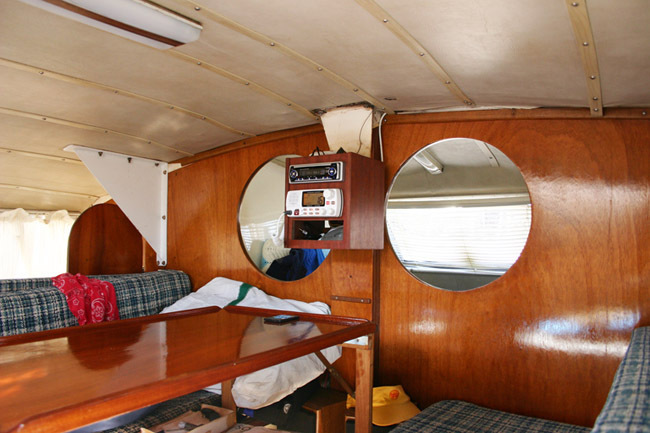 Anyone who owns a Catamaran uses the saloon table for route planning (the nav station is used to hide from the admiral). Eventually, I realized that there just wasn't a convenient place to put traditional marine electronics anywhere on the boat and that what I really needed was a cabinet for my marine electronics. Then again, cabinet placement was going to be 90% of the challenge. I tried real hard to come up with a solution which would mount the cabinet on the inside of the rear bulkhead. I could then reach over and grab the marine radio microphone from the cockpit. After 3 months and several mockups, I gave up. It would just be too inconvenient to actually use, not to mention bumping into it when using the port side saloon to hull stairs. So, realizing this new cabinet had to go in the saloon brought about another set of challenges. 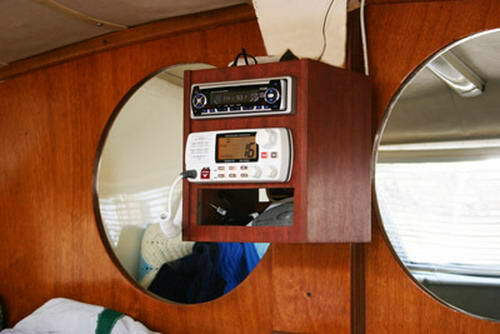 If I mounted the cabinet on the forward bulkhead, how was I going to use the any of the marine electronics from the helm or listen to FM stations without crawling over the saloon table? After months of analyzing the problem, the solution which presented itself was in selecting the right radios. I chose the Standard Horizon GX1500 Quest-X marine VHF radio because it's a quality radio and it had an input for a hard wired remote station. This remote station is a remote microphone connector on the end of a 25 ft cable which connected into the radio. They call it the RAM+ speaker microphone, model CMP25. A hole is drilled in the cockpit to mount the microphone connector. This is much more than just a remote microphone. It's the perfect addition for any boats marine electronics suite. All radio and DSC functions can be accessed at this remote location as well as having a microphone/speaker. In fact one marine VHF becomes two radios. This marine VHF radio also adopted the new DSC standard and has twin marine VHF receivers. One for normal marine VHF traffic and a digital receiver for the marine DSC channels. When I was doing my shopping, I discovered that the twin receivers were only implemented in better radios at that time. Today I think all marine VHF radios have them. With 1/2 the problem solved, I turned my attention to the entertainment portion of the challenge. OK, technically not marine electronics, yet what else can you call it? This was solved with an automotive AM/FM/CD/MP3 radio with auxiliary input and remote control. I selected a Phase Linear UMP301. Although intended for autos, I figured it would work just fine for Catalpa. I picked this up for next to nothing at local consumer electronics store. ($70). The MP3 compatibility is great as you can burn music 'data CD's' on a computer which play for hours and hours. As for building the cabinet? A good question. Has anyone priced out cabinet grade solid teak wood lately? Fortunately I just happened to have just enough teak laying around to build a small cabinet. So why is there a photo of dinghy davits on the marine electronics cabinet page? It's here to show you where that teak came from. 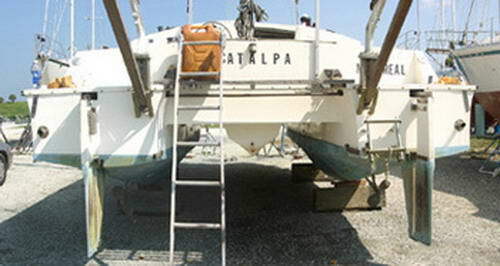 I removed these davits you see in the photo when we bought Catalpa. I just wasn't pleased with the way they were mounted (that's another project tale). With the davits off the boat, I was left with those two long boards you see stuck into the base of the davits and extending up and out of the photo. These boards were rough cut 2 x 3's about 5 Ft long, which had been left in the elements for a long while. They were drying out in my garage for 3 years as I'm one of those people who hesitates before discarding anything. One day, out of curiosity, I took one these boards and sanded it a bit to see if I could tell what kind of wood it was. I figured they'd use some kind of oak. I was stunned to find they were solid teak. This was not going to go to waste. So, I after determining where the cabinet would be mounted, I sat down and drew up cabinet plans one day and confirmed, if I was careful, that there was enough wood in one of these boards to complete a small cabinet. In the design, I recessed the top about an inch, which allows the top of the radio to double as a shelf. The first step is always the hardest. I picked what looked like the best board and cut it to size on my table saw. I then resawed the short 2" x 3" x 12" sections into planks using my band saw. In no time at all I had enough 1/2 inch thick teak planks to make a very nice small cabinet, The next step was using the planer to even out the resawed boards and then I used my gluing table to assemble these narrow 3" wide planks into very nice teak panels. My two radios are designed for dashboard type mounting and of course my front panel is solid. A considerable amount of time on this project was spent on drawing the cutouts on the front panel and using a skill saw to cut them out. Teak is a hard wood and this was no easy feat. When this was done, all I needed was a handful of wood dowels and some glue. The result was an assembled small cabinet. The last step was applying the finish. OK, I'll admit it, I'm a back yard cabinet maker as well as a sailor. This project gave me the opportunity to combine two of my hobbies and solve part of the marine electronics storage challenge. The result, speaks for itself. There's a reason it's a little bit red as it has to do with the type of tree the wood was harvested from. Still, it blends in fairly well with the newly refinished bulkhead it's hanging on. Overall, I'm pretty happy with the way it turned out. You'll notice an opening in the cabinet below the radios. This is strictly storage space for CD's and cables. I thought I'd need a door here to keep things in place, but so far we've only been out on flat water and it hasn't been necessary. In the back of my mind I was toying with adding a chart plotter, or AIS here. If I can figure a way to squeeze one in, the marine electronics suite would be 90% done. The last step in the project was running a 25 FT control wire to the remote helm station. Actually, this didn't take long at all as catamaran construction lends itself to easy wiring. I did have to drill a hole for the connector but this was a small price to pay for having a VHF remote station at the helm. Incidentally, this remote connection isn't an either/or proposition. 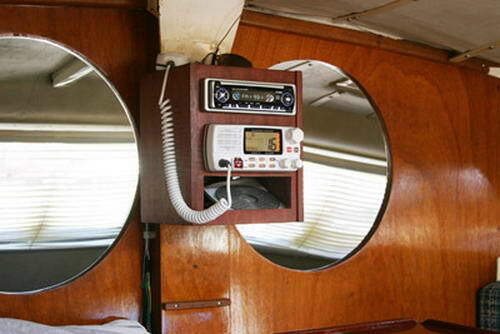 The VHF radio can be used from either the saloon table or the cockpit. I'm really happy with this, it works well and the cockpit connector looks terrific. The AM/FM/CD/MP3 required an antenna terminated with the Automotive type connector. I thought about this for a while and ended up with a straight piece of tinned wire about 40 inches long which I tinned soldered on one end. This tinned end fit the center connection in the antenna socket and I just bundled this in the radio wiring which seems to work pretty well. The radio is run by remote control. It sounds great and is easy to use. The remote control is on the table in the photo below. I've put as many as 200 songs on one CD which pretty much covers an afternoon of sailing. When at the dock, I've connected the auxiliary input to the output of my laptop and watch TV and movies using the amplifier of the radio. It all works pretty well, although I do have one issue with this radio. I only have 2 of the 4 audio channels connected to speakers, and full volume is loud but not over powering. I'm considering adding two additional speakers and a subwoofer. I haven't done it yet because of my DC power budget. These boom / boom radios sound great but do it at the expense of your batteries. Right now I'm using 13 watts RMS X 2, so roughly 2 amps. My solar panel handles this without any problem. However, if I double the output power to 52 watts, this is about what my 75 watt panel outputs on a normal sunny day. Running the fridge would put me in a negative power situation. At any rate, I'm still thinking about it. Of course, what's a new marine radio without a new antenna and coax? Just follow that link. To date I've completed 20 boat projects and have had time to write about 3 or 4 of them. I'll try to do better next year. Now, the real question is... I have one teak board remaining.....any one have a suggestion?